Once you’ve gathered up all your barware, glassware, ingredients and have mastered all the recipes in this book, it’s time to throw your very own kiddie cocktail party! 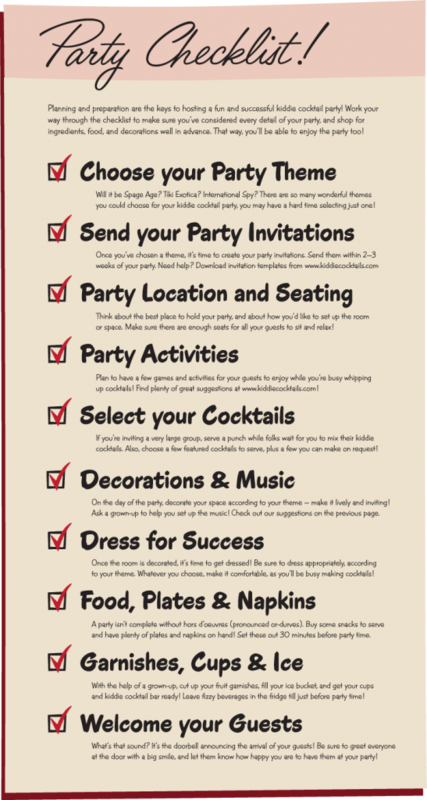 To make your party a smashing success, we’ve prepared a ten-point pre-party checklist to help you get organized! Planning and preparation are the keys to hosting a fun and successful kiddie cocktail party! Work your way through the checklist to make sure you’ve considered every detail of your party, and shop for ingredients, food, and decorations well in advance. That way, you’ll be able to enjoy the party too!